Sprint is joining the ranks of carriers that will take your cash for the promise of delivering a Galaxy S5 to your door next month. The device can be obtained in two ways on the Now Network – $199.99 (after a $50 mail in rebate) with a contract, or $0 down and monthly payments with Easy Pay. The Samsung Galaxy S5 on Sprint will have support for Sprint's new Spark tri-band LTE, but market availability will vary. 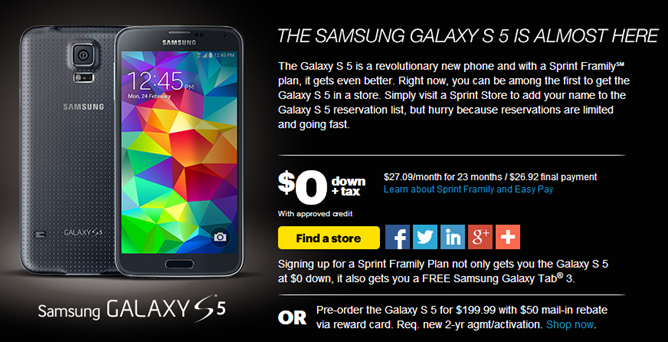 Sprint is also running a promotion if you buy a GS5 and start a Framily plan. Do that and you can get a free Galaxy Tab 3 7.0 on a 2-year contract. Yeah, not the best deal considering it's an on-contract tablet that usually sells for $50, but free is free. 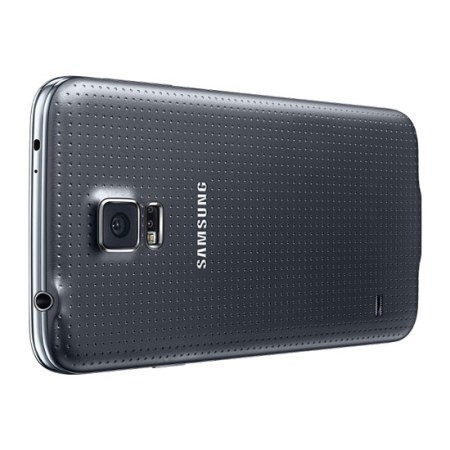 Like the other carriers, Sprint will try to ship your GS5 so it arrives on or around the April 11th launch. Bonus: there doesn't appear to be any Sprint branding on the device (assuming the promo image is legit).